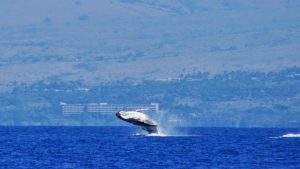 How do Humpbacks Find Hawaii? We were met with challenging ocean conditions for Monday’s Wake up with the Whales Cruise, but of course, the Humpbacks spend most of their time under the surface (especially on days like today), so they weren’t as affected. Saying that, we did see Humpbacks…including a pod of two who surprised us by surfacing and spouting just 20 yards from us at our 2:00. We really had no idea they were underwater in our vicinity (another reason why we navigate so slowly and carefully during the winter months). After spouting, these whales kind of slipped under the water…and that was the case with most of the other whales we saw — none of them were lifting their flukes when they sounded. We also saw a couple of whales breaching way up the coastline, but with the wind blowing the way it was, we couldn’t go to see them. Guests on our Mid-Morning Whale Watch Cruise got to watch Spinner Dolphins interacting with a Humpback. When we see this, it always looks to us like the dolphins are more interested in the whales than the whales are in the dolphins, but that may be because when we see them, the dolphins are always zipping around all over the place, and the Humpbacks seem so placid in comparison. We also got to watch a different Humpback do a couple of peduncle throws and a head lunge. Though it was windy, we did get a chance to deploy our hydrophone, and we heard some pretty loud singers, so we know there was a lot going on underwater in our area too. Ocean Sports Whale Fact of the Day: Though no one is really sure how Humpback Whales are able to navigate so accurately through the open ocean to find Hawaii, research conducted on the migratory paths of a few South Atlantic and a few South Pacific Humpbacks between 2003 and 2007 did show that regardless of currents on the surface, storms and obstacles, the humpbacks never deviated more than about 5 degrees from their straight-line paths. Researchers don’t think the whales are relying solely on the earth’s magnetic fields for navigation, since magnetism varies too widely to explain the straight paths the whales swim. They also don’t think the whales are relying solely on the sun to navigate (like many birds do) because the ocean wouldn’t provide an adequate frame of reference. It’s possible the whales use both those methods, combined with celestial markers. Or maybe the whales navigate by following the sounds of each other’s voices. Will the documented weakening magnetic fields around the earth and the shifting of magnetic north alter Humpback migratory behavior? Researchers are working to find the answers.